A great coin trick that can be performed sitting or standing and anywhere close up magic would be appreciated. The magician reaches into a jacket pocket and pulls out three coins then tosses them on the table in front of him. He picks up two of them and puts them in his left hand and puts the third coin back in his pocket. With a magic word, the third coin is shown to have joined the other two in the magician’s closed fist. Over and over the coin refuses to stay put, until all three coins mysteriously vanish! The finger palm and multiple coin vanish are used, along with a secret, fourth coin. Four coins of the same denomination are needed, all roughly of the same appearance. No one coin should be obviously marked or stand out in any way. A dinner jacket works well with this trick. Place four coins in the right pocket of a dinner jacket or a pair of trousers. This trick is best performed wearing a jacket and seated, as it makes the final vanish less obvious, but it can be done with trousers and standing with a bit of extra practice. The magician reaches into his right jacket pocket and finger palms one of the four coins. He then pulls all the coins out, with only three visible, held in his finger tips. The three coins are tossed on the table in front of the magician. He then picks up one coin with the right hand and tosses it openly into the left palm. A second coin is picked up with right hand and tossed into left, but this time the secret finger palmed coin is tossed with it. A quick close of the left fist will hide the fact that it holds three coins instead of two. The third coin from the table is picked up and apparently placed back in the jacket pocket, but secretly finger palmed. The right hand should then rest easily on the table. 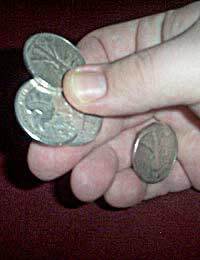 The left hand is opened to show three coins, as if the coin in the pocket could not be separated from the other two. All three coins are tossed on the table. The magician picks up two coins, one with left hand and one with right. The right hand coin is tossed into the left hand on the fingers, where it can be finger palmed. The left hand dumps the coins to the right, but secretly finger palms one. Only one coin transfers, but as the right hand already held a coin it is opened to show two coins. Both coins are placed on top of the left fist and shown to sink into the fist. The remaining coin on the table is placed in the right pocket, and the right hand, now empty, rests on the table. The left hand is opened to show three coins again. The coins are tossed on the table. The right hand picks up two coins and then does the Multiple Coin Vanish (appearing to put them in the left hand but retaining them). The last coin is picked up with the right hand and put in the pocket. The magician should take pains to quietly put all the coins in the pocket and pull out his empty right hand. The left hand is opened to show all the coins have vanished. When opening the left hand to show that all three coins are there, a quick, jerky motion should allow all the coins to pop slightly, making it appear as if the third coin has just arrived as you opened your hand.